Tired to dragging your suitcase through airports, hotel halls and down sidewalks? 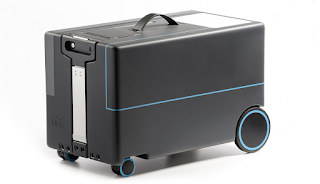 The Israeli company Nua Robotics has designed suitcase that will follow you like a good puppy. The carry-on case uses a built-in camera sensor to know where you are and where you’re headed. The device use its battery to charge your electronic devices. Of course, you are on your own when it comes to stairs and escalators. No showed a prototype of the suitcase at CES this week. It did not disclose plans to sell the suitcase or how much it might cost, but it is taking emails at the Nua website.